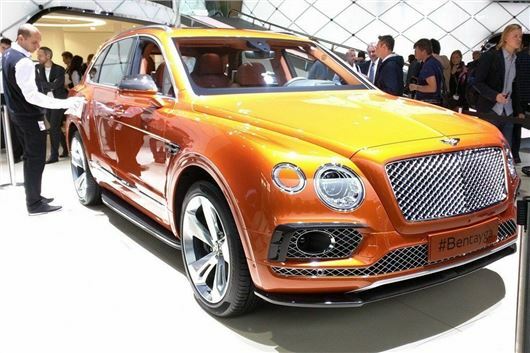 Bentley has unveiled its first luxury SUV at the Frankfurt Motor Show 2015. The new Bentayga off-roader is built on the Audi Q7 platform and will cost around £140,000 when it reaches showrooms in 2016. Boasting Range Rover-rivalling levels of opulance, the Bentayga will also scare Porsche with its Cayenne-worrying 6.0-litre twin-turbo W12 that's expected to produce 600PS and a whopping 900Nm of torque. Expect the Bentayga's 0-62mph time to be just over four seconds with a top speed of 187mph. Economy is obviously not a strong point. We're told that CO2 emissions will be below 300g/km, with fuel economy around 22mpg. A plug-in hybrid option could be available from 2017. Unsurprisingly, the interior is luxurious, with hand stitched leather seats, soft-touch hide trims and metal pull switches for the air vents. The Bentayga can accommodate five adults, although this diminishes to four if individual and adjustable chairs are specified for the rear. Based on the Audi Q7 platform, the Bentayga will get four-wheel drive and air suspension (with adjustable ride height), along with selectable driving modes to adapt the engine, gear and damping response to cope with everything from icy conditions to mud laden off-road tracks. So there's no low-range gearbox, but there are eight driving modes - Bentley, Sport, Custom, Comfort, and four off-road modes. There's also an electronic hill descent control, so it should be able to hold its own out in the fields... if it ever gets that far.